Sorry if this has been posted before, but got this morning to go work and started the car to see that the battery light had come on, i checked the battery indicator and is was low all the way down to the end, do you think i need a new battery or will it charge up when i start to drive the vehicle? It may charge up but it does sound like it's on its way out. Prob best to just replace it. Check if alternator charges it properly. If car has electric heater in heater matrix, when below 6 degrees alternator give's 15+ volts, but I don't know if these audis had those already. If the battery is 5 years old or more, there is a good chance it is coming to the end of its life. I got sometimes message Low Battery and advise to drive and it will be charged during driving. Never problems and car is almost 9 years old with factory fitted battery. Given its age, it is my opinion that the battery is near the end of its useful life. Started car without problem and drove the car in city only. It is happening last two years from time to time but no problem to start the car. I have read that alternator is not charging the battery all the time only when needed. It's not necessarily a battery coming to the end of its life - it might be that. You might find, as I've been experiencing myself, that your car has an electrical glitch that is causing the car an excessively long time to shut-down after you've turned the engine off and locked her. Easy way to tell, is to use the car, shut her down, and watch how long it takes for the hazard light switch on the main dash to go off. If all is well with the systems, it should go off in just a few minutes. If there's an issue that's causing it a while to shut down, the hazard light will remain illuminated for an hour or two. 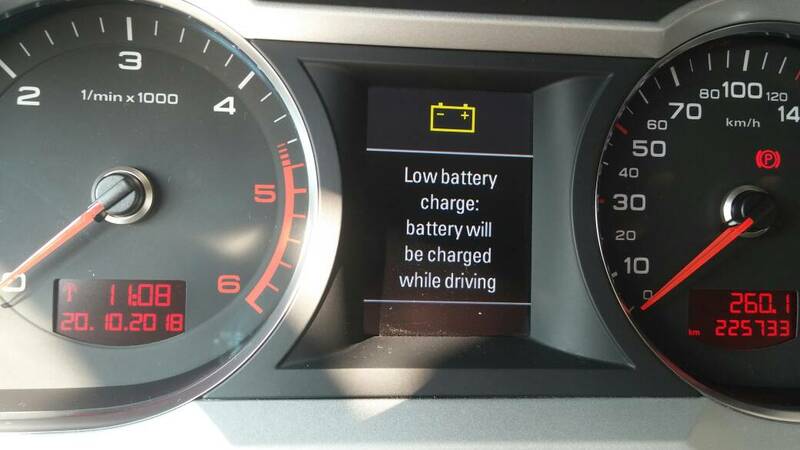 If it's staying on for a couple of hours, the cars systems are still running, despite the car being "off", and this is draining your battery. A battery change would not cure this. Easiest to check it in the early dark evenings, as it's much easier to see if the hazard light on the dash is still on or not! Please Help Battery light on, alternator OK, but battery not being charged.